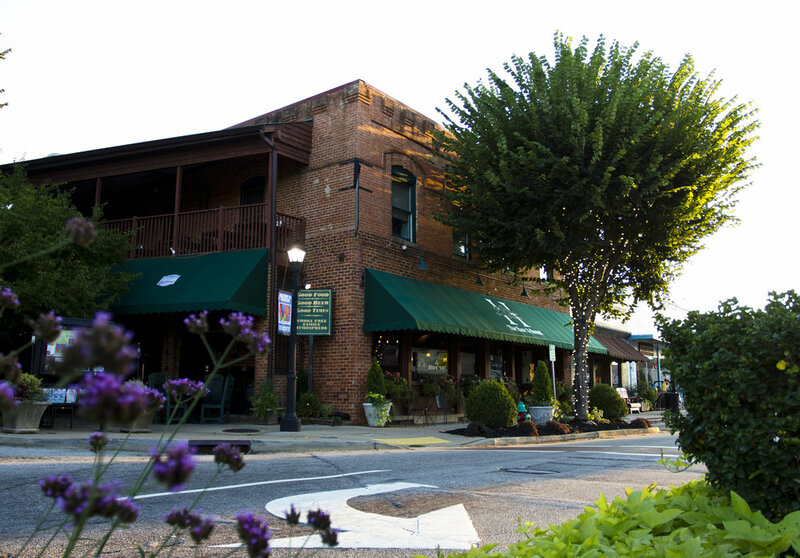 Nestled in the Blue Ridge mountains of upstate South Carolina between Spartanburg & Asheville, you will find vintage brick buildings built in the late 1800's & early 1900's that are now home to antique shops, galleries and restaurants. The Hare & Hound Pub was once a mercantile that provided supplies to the thriving textile and agricultural industries. Our charming small town was recognized by Southern Living Magazine as one of the "Best Small Towns in the South" for 2016. Since 2002, The Hare & Hound Pub has been a favorite of locals & visitors alike - serving classic pub & traditional American fare, specialty salads, sandwiches, teaks and Rick's Famous Baby Back Ribs. The bar features an ever changing selection of imported, domestic & craft beers. s the wine market evolves, so does our wine list. You will always find a great variety of reds, whites & bubbles.Full beverage service is available. Your choice of Certified Angus Beef® burger, Veggie Burger, or Chicken Breast grilled & served on toasted brioche bun with one side item. PLEASE LET US KNOW HOW MANY ARE IN YOUR PARTY AND WHEN YOU WOULD LIKE TO RESERVE A TABLE. Please NOTE: If you want to reserve a table in 60 minutes or less, please call instead! ALL DINNER RESERVATIONS MUST BE REQUESTED BY 4PM! If you do not receive a confirmation to your reservation via phone or e-mail, your reservation is not confirmed. (864)-457-4218 for catering & private parties. We offer full service event planning and catering. We have a private room with an open balcony overlooking downtown that will accommodate up to 50 seated guests or 75 guests for cocktails and hor d'oeuvres utilizing the outdoor balcony. We would be happy to meet with you to discuss your specific event in detail including wedding receptions, business meetings, seminars, bridal luncheons, retirement parties, holiday celebrations, etc. We're available breakfast, lunch and dinner. Our catering teams have countless years of experience from restaurants, private clubs & resorts around the country. We have created catering menus but are happy to customize based on your needs and desires. If you don't see what you like, just ask! We are happy to utilize our facility or travel if applicable. We look forward to hosting your next big event! Please complete the form below for catering inquiries. Every Monday after 5pm, try our Milehigh Meatloaf special! Friday & Saturday night after 5pm, try our weekend specials.